I just did a turbo swap. Did a fp mani with a hta71 turbo. Everything is installed and the car idles fine. There's no jitters or anything like that. The problem comes when i get on the gas and it takes 4 every to get moving. I hear the turbo spooling like hell but she is not really moving and the bov flutters like there wasn't much air. Even after a pull at 4k there's not much bov sound and the car doesn't really take off. Anybody have a clue as to what the issue could be? Massive boost leak. If not: dead turbo. Pictures of turbo. Especially the blades on each end. 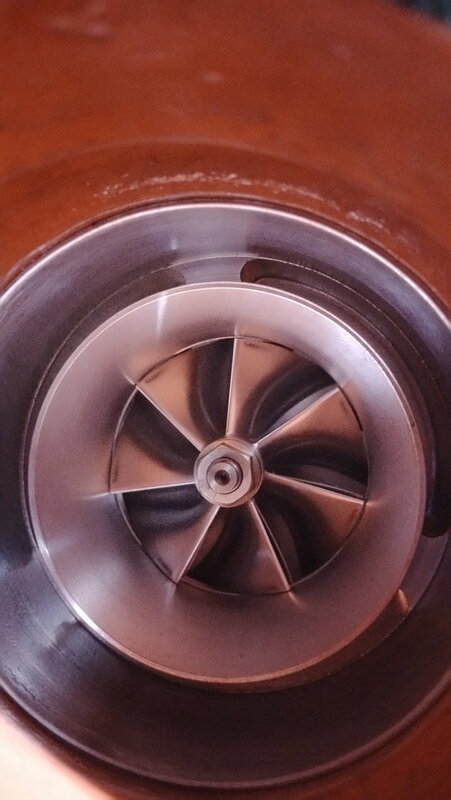 it is possible to have a bad new turbo when the wrong wheel is used. You did a boost leak test? what was your previous turbo/ setup? Could it be tune related? Not tuned yet. We just finished yesterday took it around the block and noticed a hi pitched squeal like something was open but we checked everything 14 times. Fp turbos usually that loud? 99% of the time it's a boost leak. That's the easiest and cheapest thing to do. I'd say Start there before stressing about all the bigger stuff. If it has the FAP cover ,yes. Also,.If you have a bad enough boost leak, the turbo could be spinning 1,000,000RPM and sucking a ton of air, which could be pretty noisy. pop off the intake pipe from MAF and take a picture of blades.